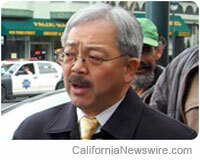 SAN FRANCISCO, Calif. /California Newswire/ — SF Mayor Edwin M. Lee today celebrated the submission of the San Francisco Bay Area regional bid in partnership with the San Francisco 49ers and the Super Bowl Bid Committee to the National Football League (NFL) to host Super Bowl L/LI in 2016/2017. The Super Bowl game, which would be held at the 49ers new stadium in Santa Clara, Levi’s Stadium, would bring hundreds of millions in revenue for the entire Bay Area region. The committee, led by Tipping Point CEO and Founder Daniel Lurie, has raised more than $30 million in commitments from the business community to host the Super Bowl in the Bay Area, with 25 percent of proceeds going back to youth and local charities. “There’s no better place to play host to the Super Bowl and celebrate one of our nation’s greatest sports than right here in the San Francisco Bay Area,” said Mayor Lee. The NFL officially invited San Francisco and Miami, Florida, home to the Dolphins, to submit a bid to compete to host the 50th Super Bowl. Lurie submitted San Francisco’s application to the NFL’s Super Bowl Advisory Committee on August 9, 2012. The Committee delivered its bid package to NFL owners on May 7, 2013 with the complete bid package on an Apple iPad Mini. On May 21st, San Francisco will formally present its bid in a live pitch to the 32 NFL owners in Boston. The city that is not selected to host Super Bowl L will be invited to submit a second bid to host Super Bowl LI in 2017, competing against Houston. The Super Bowl bid includes more than 22,000 hotel rooms set aside and official and unofficial events will be hosted throughout the Bay Area region, with free public celebrations and the NFL Experience in San Francisco. A key part of the bid is the new Levi’s Stadium, which includes high-speed WiFi for 75,000 fans and sustainable design materials, such as a green roof and a robust regional public transportation system to move fans around the Bay Area. Today the bid committee announced that it raised $30 million in pledges from partners including Apple, Boston Consulting Group, Dignity Health, Gap, Google, Hewlett Packard, Intel, Yahoo!, Seagate, and ValueAct Capital. Twenty-five percent of the funds raised for the Super Bowl Bid will go directly to philanthropic efforts that help children and families living in poverty in the Bay Area. A separately-governed nonprofit body will be launched to administer this first-of-its-kind effort.